Sangpo Bumtri is the creator god of Bön. Together with Satrik Ersang (Sherab Chamma), Tonpa Shenrab, and Shenlha Odkar, he is one of the Four Transcendent Lords. He has “neither eyes to see, nor hands to hold, nor ears to hear, or nose to smell, he has only his spirit.” He possesses a silver body. 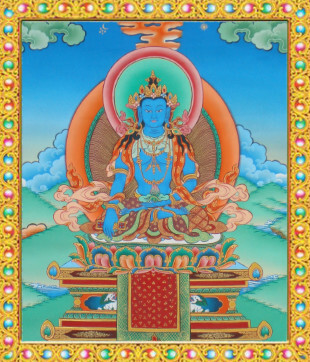 Shenlha Odkar is the deity of Supreme Compassion. Out of his compassion the Bon teachings and practices have grown to assist all sentient beings on the path to liberation. He is the master teacher of all teachers and teaching has become his primary activity. Odkar/Wodkar means ‘white light’ and his natural body is pearlescent, the body of perfection (dzog ku). Shenlha Wodkar is always dressed in elaborate, ceremonial robes with his hands in the meditation mudra. He sits on a throne supported by two snow lions, which represent Shenlha Wodkar’s supremacy over all life forms. Tonpa Shenrab, the Completely Enlightened One, the founder of the Yung Drung Bön religion, was born in 16,017 BC in the land of Olmolungring. Tonpa Shenrab appeared as an ordinary man. Before he attained enlightenment, he went through the six realms of cyclic existence in countless births. He entered the door of enlightenment through the practices of accumulating merit and purifying himself, resulting in the attainment of the transcendental qualities of compassion. He is superior among all the exalted enlightened beings and is dedicated to the liberation of all sentient beings. In order to rescue them, he turned the Dharma Wheel of Bön three times as an antidote to all suffering. Tonpa Shenrab is holding a Yung Drung Chakshing in his right hand and his left hand is in the meditation mudra. Yum Chen Sherab Chamma (The Great Wisdom Loving Mother) is known as the Mother of all Enlightened Ones and source of all love and Compassion. She has many countless manifestations and also countable ones. Chamma is the feminine counterpart to Shenlha Ödker. Her body is also “dzo ku,” the body of perfection. Chamma is available to everyone for comfort, guidance and healing as she has the power to dispel all obstacles such as fear, sickness, sadness or negative impact of demonic forces. Chamma holds a mirror in her left hand and a vase in her right. By Her blessing and outpouring of energies, she eliminates all Karmic obstacles. She heals, blesses and guides us. 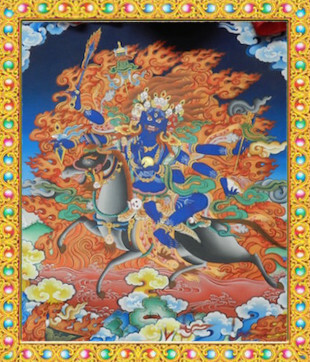 Sidpa Gyalmo (Sipé Gyalmo), Queen of the Universe, is the chief wrathful protector deity of Yungdrung Bön. 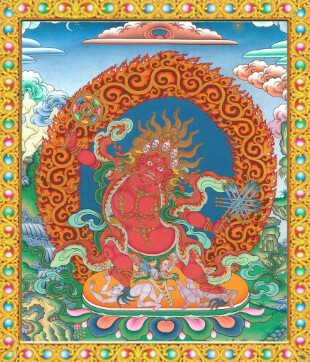 She is Sherab Chamma taking a wrathful form in order to frighten evil ones and to protect and heal all sentient beings. 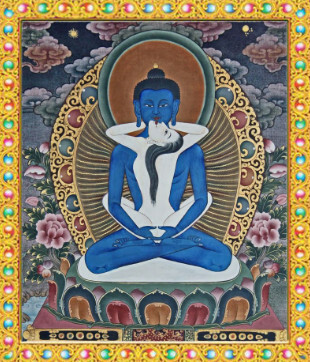 Sipe Gyalmo is indigo in color with three faces: the right face is white, the left face is red, the center of the face is indigo. She is riding on a mule and has six arms holding a victory banner, a sword made of a thunderbolt, a phurba (glorious dagger), a mirror, a hook, and a skull cup filled with blood. Her body is draped in skulls and fresh flayed human skin. Sipe Gyalmo has a special shrine in all Yungdrung Bön temples where prayers are said to her round the year, morning and night by a Sipe Gyalmo prayer master. These prayer masters thank her for her special love and protection of Yungdrung Bön and all sentient beings. They ask her to liberate the world from evil and bring everlasting peace. 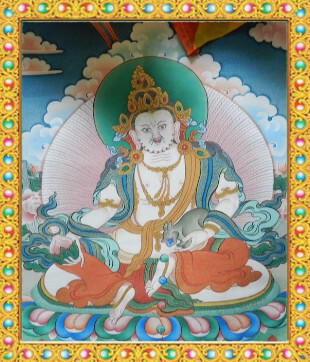 Yeshe Walmo, Wisdom Protector, is considered the wisdom aspect of Sipe Gyalmo and the semi-wrathful form of Sherab Chamma. Throughout the ages, whenever Bön suffered persecution, lamas would hide Bön texts and sacred ritual objects in mountains. Yeshe Walmo is the deity in charge of keeping these texts and sacred items safe. She is the preserver and protector of all Bön wisdom and allows these objects to be found when the time is right. Yeshe Walmo is in the same color as Sipe Gyalmo, but has only one face and two arms. She’s standing on one foot dressed in peacock feathers, symbolizing the transmutation of poison (ignorance). In her right hand, she holds a flaming thunderbolt sword, and in her left holds a vase. She wears a tiger skin, and stands upon a lotus flower, surrounded by flames burning all ignorance. Yeshe Walmo works swiftly when called upon for any assistance. 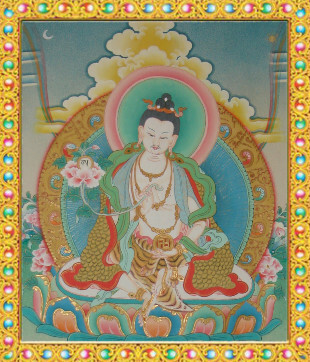 Nyammed Sherab Gyaltsen is sometimes referred to as the second Buddha of Bön. He was born in the Gyalrong province of Tibet on January 5, 1356. At age ten, he was ordained a novice monk, and at 31 a fully-ordained monk, when he was given the name Sherab Gyaltsen. He studied at Yeru Wensa Kha, the main monastery of Bön, before it was destroyed by a flood and landslide. Later, he founded sMenri Monastery in southern Tibet in 1405 AD. He became the first Abbot of sMenri where he unified all three lineages of Sutra, Tantra, and Dzogchen of Bön. sMenri became the mother monastery of Bon for centuries. In 1959, during the Cultural Revolution, sMenri was destroyed. It was reestablished in northern India by Yongzing Tenzin Namdak Rinpoche and Lungtok Tenpai Nyima Rinpoche, the 33rd Abbot of sMenri. Sherab Mawe Senge is known as the Wisdom Deity and is depicted with either white or orange skin. In his hands he holds the sword and the lotus flower. He is seated on a dragon throne, which symbolizes the sublimity of his speech. Sherab Mawe Senge is associated with Wisdom and is called upon by believers during the doctrinal debates. 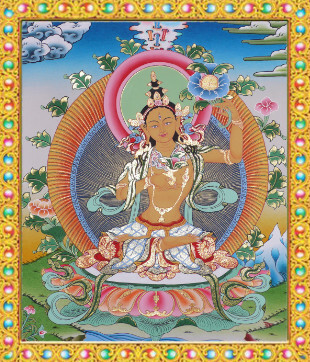 Nyammed Sherab Gyaltsen, the first sMenri Trizin, is considered to be an emanation of this deity. Kuntu Zangpo (Samantabhadra in Sanskrit), together with consort Kuntu Zangmo, is understood as the Primordial Buddha from which Lord Tonpa Shenrab was emanated and took a human body for the benefit of all sentient beings. The name Kuntu Zangpo means “that which is most excellent and present in all places.” The texts refer to Kuntu Zangpo as being “Self-Awareness”, “True Self” and “Source of the Self.” Like a mirror that reflects everything, Kuntu Zangpo is the emptiness and clarity of the base — the Nature of Mind itself. He has never been touched or corrupted by the emotional defilements. He represents a state of total primordial purity and is the embodiment of the Bonku (Dharmakaya), the ultimate aspect of enlightenment. Drenpa Namkha means “memory as vast as the sky” according to H.H. 33rd Menri Trizin. This deity has knowledge of the past and the future as well as the present. 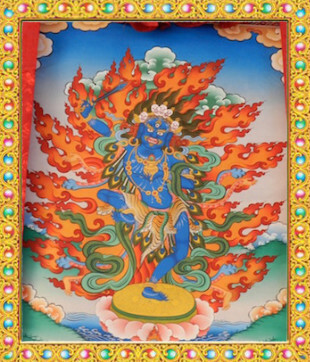 Drenpa Namkha provides protection from bad fortune, disease, and unhappiness through aspects like the Medicine Buddha and the prosperity deity Zamba Lha. 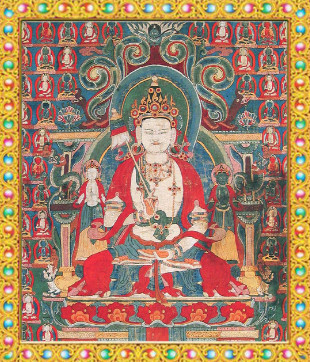 The deity has appeared in human manifestation as a prince in Zhang Zhung and later was born in 718 as a Tibetan who preserved teachings and made prophecies for a future time such as the present. 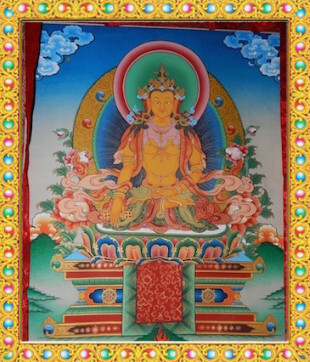 Tsewang Rigzin is the main Long Life Deity of Bön. In the Bön tradition it is said that he was the son of Drenpa Namkha. He was a realised master and Siddha. Many of the depictions, practices and rituals of Tsewang Rigdzin arise from a Bon Terma (‘Revealed Treasure’) text discovered by Terton Bonzhig Yungdrung Lingpa (1346-1405). Because Bon considers human life rare and precious, there are spiritual practices with the purpose of healing any damage to the lifespan and for removing any obstacles that could interfere with the complete fulfillment of the lifespan of an individual. One of the most common practices to attain these results is The Practice of the King of Longevity. Tapihritsa was born in the 17th century. From his childhood he bore a special interest in the virtuous deeds. At the age of eleven, he received complete ordination relating to Dzogchen from his master. It is believed that after accomplishing his intensive and systematic practice on Dzögchen teaching, he obtained the state of Buddhahood by dissolving his physical body into rainbow color. Attaining the rainbow body means the body disappears from sight, leaving no trace of where it has gone, other than bits of hair and nails on the meditation cushion. It is believed that practitioners of the great perfection, Dzögchen practice, may accomplish the rainbow body. As a result of Tapihritsa’s marvelous teaching as many as twenty-five disciples have attained the Rainbow Body Accomplishment. Khyung Mar or Red Garuda, is a Wisdom protector manifestation of pure awareness, one of the wrathful deities of Bön. An important Bön deity, Red Garuda represents the fiery power of energy. This deity protects against obstacles of the outer, the inner and the secret. 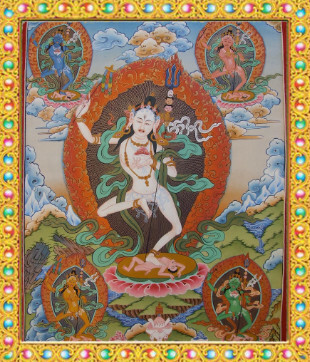 He transforms the five poisons and liberates sentient beings from suffering. He calms and transmutes the harmful energy of the lu (naga/serpent spirits) and heals sicknesses caused by them. Khyung Mar heals, exorcises and blesses self, others, and the environment. The Red Garuda healing practice is highly effective physically, emotionally and spiritually. 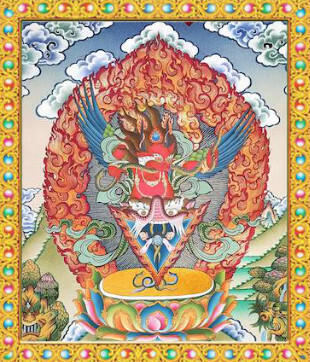 Walpur Drukse Chempa, the yidam deity, is the embodiment of Enlightened Activity. This yidam is also referred to as Phurba. He has three faces and six arms, each of which are holding a phurba, or ritual dagger. He and his consort’s body are joined below the waist and form a single phurba adorned with snakes. Both the yidam and his consort have wings. There are many ritual texts associated with Trowo Drukse Chempa. 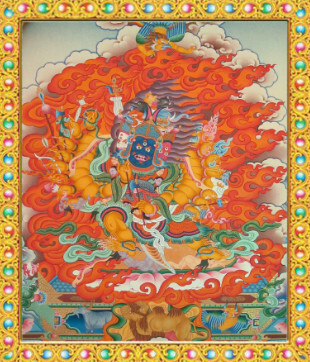 Takla Mebar, Flaming Tiger Deity, is a manifestation of Tonpa Shenrab Miwo, is one of the most important wisdom deities (Yidam) that can bless the practitioner with the power to heal. The Takla Mebar Healing heals outer poisons and negativities, transforming them into wisdom and positive aspects. This burns away inner negativities and transforms the mind of the practitioner into the clarity of the five wisdoms. 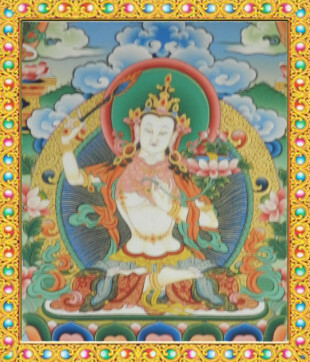 Magyu Sangchog Gyalpo is one of the most important Bon meditational deities. 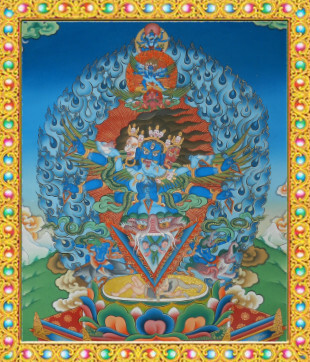 The deity Magyu is the yidam Sangchok Gyalpo, Supreme King of Secrets, who is wrathful in appearance, blue in color, with seven heads and sixteen arms holding sixteen skullcaps, each containing a heart. He embraces his consort the great queen Kyema Otso, Ocean of Light, who is red in colour, one face and two arms. 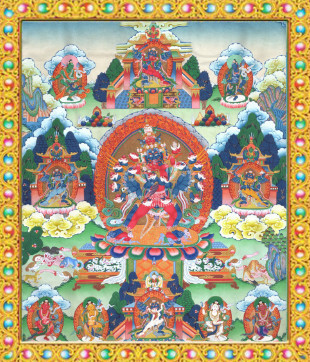 The six khandro in the thangka are the guardians of the six paths of practice within the Mother Tantra cycle of teachings: Green / Method (Tummo and Five Elements Practice); Blue / Dream (Dream Yoga); Red / Fear (Chöd Practice); Yellow / Transference (Phowa); White / Sleep (Sleep Yoga); and Brown / Death (Bardo Practice). 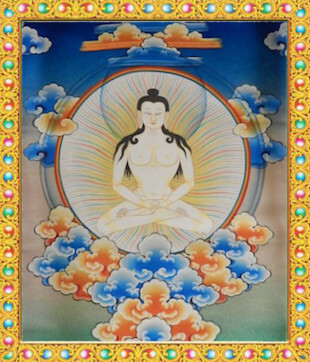 Kyema Ötso, Ocean of Light, is the Great Mother Khandro found within the Ma Gyud cycle of teachings. 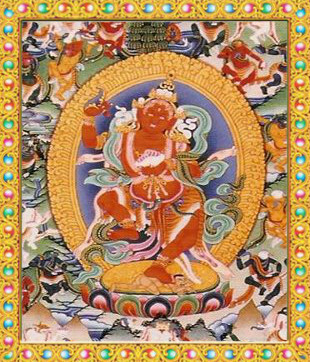 She is one of the five great Chöd lineage khandro of Bon, together with Kalpa Zangmo, Thugje Kundrol, Oden Nyibar, and Sidpa Gyalmo. Kyema Otso’s skin is usually red, but is sometimes depicted as yellow. She is shown holding a curved blade in the right hand and the practitioner’s skull cap in the left. The Five Khandro of the Elements (Space, Air, Fire, Water and Earth) play a fundamental role in Bon. These five are understood as the underlying energies from which all experience arises, including the physical world, our bodies, our emotions and our minds. Each element is associated with a khandro (dakini in Sanskrit), or goddess. The khandros represent the pure, enlightened aspect of the elements. The central figure is the white khandro of space, the great mother from which all the other elements arise. In her right hand she holds ornaments and jewels, and in her left hand she holds a skull cup filled with essential nectar. The khandros of air (green), fire (red), water (blue) and earth (yellow) surround the central figure. 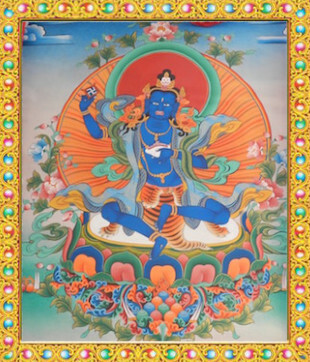 Sangye Men Lha, Medicine Buddha, is a manifestation of Tonpa Shenrab, the original Bon Teacher and Enlightened One. 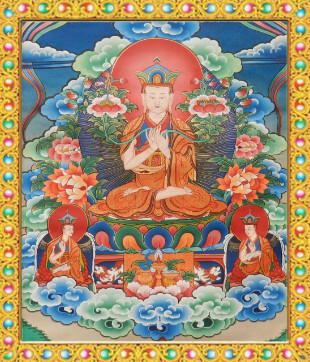 The teachings of Medicine Buddha were then transmitted in a continuous lineage to the founder of the original sMenri Monastery, Nyammed Sherab Gyaltsen, a lineage that has been preserved unbroken to today. Menlha possesses the perfect body (dzo ku). He sits resplendent in his ceremonial robes and lotus crown on a lotus throne supported by two white elephants. Menlha’s right hand holds a Yungdrung Chakshing. His left hand is in a meditation posture holding the Arura (principle seed of healing) still in use today. He sits in the Vajra cross-legged position and gazes toward the west. All beings receiving the blessings of these teachings shall be healed. 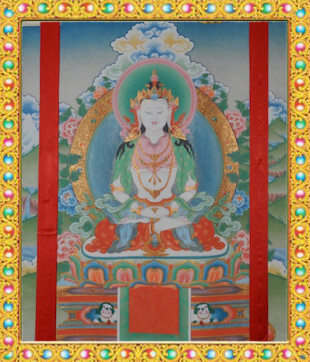 Zhangzhung Meri is a meditational deity of Bön arising from the ancient land of “Zhang Zhung” in Tibet. He is believed to be the High Protector of the Zhang Zhung Nyen Gyud lineage. The Zhang Zhung Nyen gyud is an oral tradition – the most ancient Dzogchen cycle still practiced today. It began with the primordial Buddha, Kuntu Zangpo,and ran through a lineage of nine Dersheg-Buddhas, then through Masters from the Deva and Naga realms, arriving in the realm of humans in the country of Tagzig, from where it passed into Zhang Zhung and Tibet in prehistoric times. It has never been interrupted nor have the teachings been concealed; they are still very much alive today, a great source of unmodified Dzogchen. Academics believe this protector deity to be one of the oldest deities of the Bön religion. om red na ku we ra ha! yag sha zam bha la ye so ngo dub red na si ti dhu! Zamba Lha, Prosperity Deity is the deity who manifests wealth and prosperity. He is adorned with heavenly silk garment, sits on a naturally emerged throne, pressing a wealth vase under his left outstretching leg, holding in right hand a sprout of rice and in his left hand, he holds a mongoose-shaped leather bag, representing a container which holds whatever you need to fulfill your wish. Tibetans love to have statue or image of Zamba Lha in their home. They believe that the deity helps to fulfill all dreams.